April 29, 2018 at 12:10a.m. Over the past several years, Roy Stacy has undergone personal and spiritual growth, formed lifelong friends and developed new ways to enhance his relationships with his four daughters and five grandchildren. 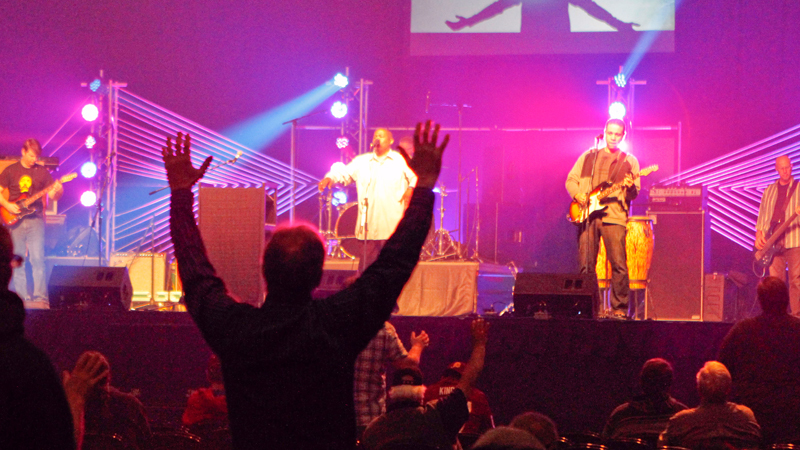 “It’s changed the person I am in general and helped me get better in touch with my spiritual side,” the Leetonia man said during Saturday’s ninth annual Men’s Rally in the Valley at the Covelli Centre downtown. The religious gathering featured five speakers as well as musical performances, and was to provide attendees with positive messages to help them strengthen their relationship with Jesus Christ and improve their relationships with family and others, noted Walter “Bing” Newton, a main organizer. The importance of this year’s rally was magnified by the large number of high-profile school shootings and other recent acts of violence in the U.S., he said. Seeking God’s guidance is a stronger answer for curbing violence and other societal problems than merely relying on more money and police to solve such challenges, Newton said. Colt McCoy, Washington Redskins quarterback and keynote speaker, shared what he sees as essential components of solid leadership, saying that commitment and professionalism do not always guarantee success, and that complacency is anathema to formulating such skills. The 31-year-old McCoy, who was selected by the Cleveland Browns in the third round of the 2010 NFL Draft, recalled some highlights and challenges from his playing days with the University of Texas Longhorns. In 2008, he led the team to an 8-0 start that included a win against No. 1 Oklahoma; that year McCoy also set school records for most career touchdown passes, wins and passing yards before being chosen as Heisman Trophy runner-up. In 2009, he finished third in the Heisman voting. Nevertheless, McCoy said, he was devastated after suffering injuries to his throwing shoulder and neck from a tackle in the 12th BCS National Championship Game on Jan. 7, 2010, in Pasadena, Calif., against the No. 1 Alabama Crimson Tide. McCoy, who grew up on a farm in rural Texas, also expressed gratitude toward his parents for instilling in him a strong spiritual foundation and emphasis on the value of attending church. The quarterback added that he hopes to emulate his parents’ example for his two young daughters. McCoy also challenged attendees to commit themselves to working for God, avoiding complacency and continuing to move forward and rise from life’s inevitable challenges. Gongwer, 48, who has many contacts in the sports and business worlds, remembered difficulties he endured in starting the book, but with God’s help, the message he wanted to share “poured out of my heart like I never experienced,” he said. Those who have benefited from the book include Youngstown State University President Jim Tressel and Ohio State University Buckeyes head football coach Urban Meyer, he noted. During the past six months, Gongwer has dealt with various health issues and family struggles, some of which caused him to nearly reconsider speaking at the rally, he said. Gongwer decided, however, to heed God’s message, which he said included persevering in the face of resistance and allowing him to intervene “in the weakest times,” he continued. Gongwer also urged those in his audience to surround themselves with positive people, as well as to refrain from confusing purpose in life with overall passion. Special musical selections were from the J.J. Weeks Band, a Macon, Ga.-based contemporary Christian group. In addition, the Men’s Rally offered 50 ministry tables and a variety of informational packets, along with T-shirts, sweatshirts and other merchandise for sale, a prayer tent and opportunities to be baptized. On Friday, men and teenage boys from Ohio Valley Teen Challenge, Warren Rescue Mission, Valley Christian Schools and other entities carried to the Covelli Centre four crosses, one each from the North, South, East and West sides of Youngstown, to kick off the rally. April 28, 2018 8:21 p.m.
May 6, 2012 12:08 a.m.
May 5, 2013 12:06 a.m.
April 30, 2017 12:09 a.m.
May 8, 2011 12:07 a.m.